SEATTLE, Nov. 14, 2017 /PRNewswire/ -- Alaska Airlines announced today that it will end a daily flight between Los Angeles and Havana, Cuba. The last flight is planned for Jan. 22. The airline will redeploy aircraft used to serve Havana to markets with higher demand. Alaska has launched 44 routes this year, which continue to develop according to forecasts. The company anticipates it will grow about 7.2 percent this year. As the airline looks ahead to 2018, its planning for nearly 8 percent network growth by adding capacity in primarily existing markets. Redeploying aircraft and crews will help the airline support the growth. 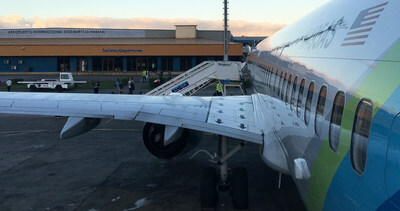 Alaska guests who have travel booked to Havana after Jan. 22 will be rebooked on another airline at no additional cost or offered a full refund.